Release 20150522 - "fix all visible"
Here's a new release of bliss, with a new way of executing multiple fixes at once, and some more useful bug fixes. 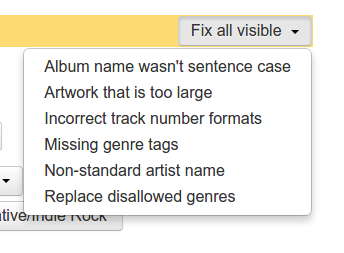 First up, a new feature to make fixing all those non-compliant music files a lot faster and a lot easier. The normal approach to automation in bliss is: create a new rule to manage a music library, and once bliss users are happy with what it does, consider automating it. The trouble is that the gap between rule creation and rule automation is often a long one. Plus, sometimes wholesale rule automation may not be desirable because of the potential for automation-gone-wrong. Only the fixes visible on the Inbox are executed. You can display more fixes, and thus execute more fixes at once, by clicking the Items per page link in the yellow bar to the left of Fix all visible. When a cover is picked from the cover art alternatives page, show success/failure and reload the row. Fix an occasional problem in bliss's regular expression rules (affecting case rules). Fix some button alignments on the individual-album change art page. Thanks to Rhea C. for the image above.